SDS’ freight includes bonded and insured freight, pharmaceuticals, perishable shipments such as fresh seafood, and air cargo. These shipments require extra security and tracking. “Anything that goes through the mail, we’re hauling it,” he says. The fleet is able to pick up shipments coming through Canadian customs at the Halifax docks and deliver to U.S. destinations. This level of reliability and control can be difficult in Atlantic Canada, given the long winter’s challenging weather and road conditions, and a limited population for finding qualified drivers. But it creates business opportunities, too. Erville Ellsworth, president of Scotian Distribution Services (left) talks to driver Joseph Mason. 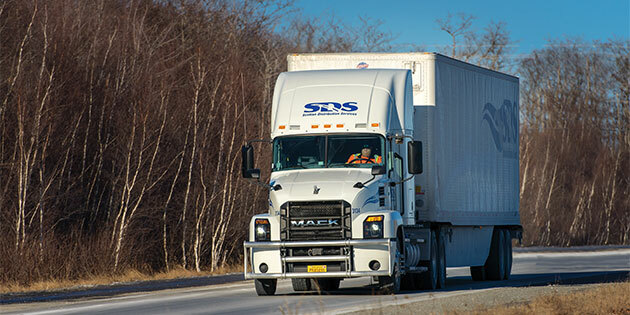 SDS in recent years has looked to Mack Trucks and its dealer, Mackay’s Truck Center, to meet its challenges. Disappointing experiences with other OEMs led Erville to closely scrutinize every purchase decision. This included visiting Mack’s Lehigh Valley Assembly Operations and the Mack Customer Center in Allentown, Pennsylvania, for in-depth knowledge of the Mack integrated powertrain and vehicle ­engineering. Halifax is an important port on the eastern edge of Canada. So while the freight market is modest and stable, it also has variety: containerized freight coming through the port for inland Canada, seafood from the local fisheries and inbound freight for the region. SDS has added several Mack® Pinnacle™ day cabs and sleepers in recent years, and took delivery of its first Mack Anthem® in 2018, and added the mDRIVE automated manual transmission to its spec. Erville notes that fuel economy is very important for the fleet, so the axle ratios are matched to the transmission ratios to downspeed the engines. SDS’s Mack trucks embody the increased need for efficiency that the fleet faces, while addressing the other demands for safety, driver acceptance and durability. “There has been a large shift from the traditional square body trucks to the more aerodynamic fuel-efficient models, and to lighter weights. These are safer trucks with a much better ride and comfort for the drivers. Respect, late model equipment, a safe working environment, scheduled work and home time are key to attracting and retaining drivers for SDS. Scheduled runs with dedicated customer linehauls help. Qualified drivers are a critical component of SDS operations and like everywhere else, are in short supply. “Anyone can apply if they qualify, then interview and road test,” Erville says. He knows not everyone will pass the rigorous security and background checks some of his routes require, but there could still be an opportunity on one of the other routes. Mack’s GuardDog® Connect telematics platform is a logical step for SDS, since Erville has been sold on telematics for years. The fleet has one employee whose only job is to monitor fuel usage, which allows SDS to quote more accurate fuel expenses to customers. Data also helps him match the right truck to the load.